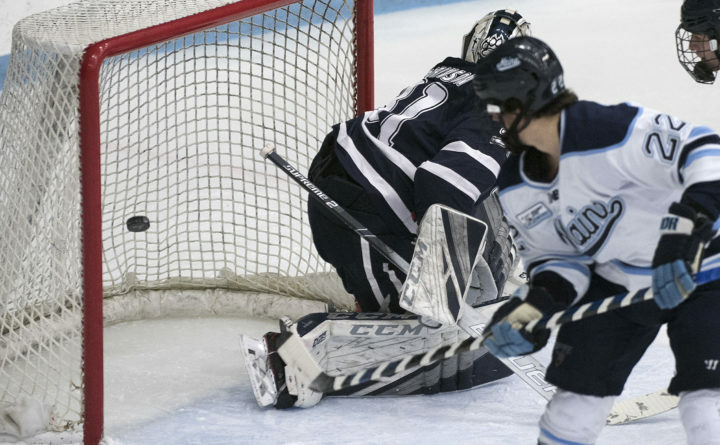 ORONO, Maine — University of Maine sophomore goalie Jeremy Swayman made 30 saves on Saturday night at Alfond Arena to lead his Black Bears to a 3-1 victory, their first win over Providence College since Oct. 29, 2011. UMaine had taken a 2-1 lead on Brendan Robbins’ shorthanded goal with 52 seconds left in the second period but the Friars had a glorious chance to tie it early in the third when Smith came to the rescue. Swayman made a save on a shot at the left post but the rebound squirted across the low slot to Bryan Lemos in the left circle and the whole net was exposed. Lemos settled the bouncing puck down and flipped it toward the empty net only to have Smith dive headfirst and deflect it into the corner. “It was just a desperation move,” said junior right wing Smith, who returned to the lineup for this weekend’s series against the Friars after missing seven games with a hand injury. “The puck was bouncing on me and I thought I had more time than I did,” said Lemos, who had the only goal in Providence’s 1-0 win on Friday night. “It just shows that every guy on this team is willing to take a puck to the leg or, in this case, to his stick [to prevent a goal]. Everybody will sell out and do whatever it takes to get a win” Swayman said. Providence coach Nate Leaman said it was similar to a play on Friday night, when Maine’s Mitch Fossier had the open net but Spenser Young dove across to make the save. “Those things seem to even out,” he said. UMaine improved to 11-14-3 overall and 7-8-3 in Hockey East, while Providence fell to 16-9-5 and 9-7-2, respectively. Fossier added an empty-net goal off a Patrick Shea pass with 56 seconds left to sew up the win. The 11th-ranked Friars had won the last 15 meetings, and was 18-0-1 over the last 19 games between the two programs. Hayden Hawkey finished with 33 saves for Providence College. Robbins scored the game-winner off a breakaway after he pushed the puck past a Friar defenseman along the boards at UMaine’s blue line. “[The Friar defenseman] kind of fumbled it and I was able to poke it through him. I was in a foot race with the other defenseman and I was fortunate to have enough gas to beat him [down the ice]. I was just thinking shot and I put it low, blocker [side],” said the swift-skating Robbins, whose 22-foot snap shot was the sixth shorthanded goal allowed by Providence College this season. “It was a dumb play. [Our defenseman] tried to force it when [the play] wasn’t there,” Leaman said. The teams swapped first-period power-play goals as Chase Pearson opened the scoring for UMaine at the 11:39 mark before Brandon Duhaime equalized 3:44 later. Pearson scored his 15h goal of the season and fourth on the power play, both team highs, off a Brady Keeper assist. It was a 4-on-3 power play and Keeper had the puck at the right point and tried to slide a diagonal pass to Pearson, who was skating down the left side into the faceoff circle. The pass deflected off a Friar stick and landed right on the stick of Pearson, who swept the puck into the short-side corner before Hawkey could push across. Duhaime tied it when he was parked at the top of the crease and he redirected a Jason O’Neill pass from the right side past Swayman. “We definitely wanted some revenge. It felt good to win,” Robbins said. “[Hawkey] had a real good third period Friday night and was the difference in the game and tonight Swayman was the difference. We had some really good looks but he came up with some saves,” Leaman said.